Objective To obtain summary estimates of the accuracy of a single baseline measurement of the Elecsys Troponin T high-sensitive assay (Roche Diagnostics) for the diagnosis of acute myocardial infarction in patients presenting to the emergency department. 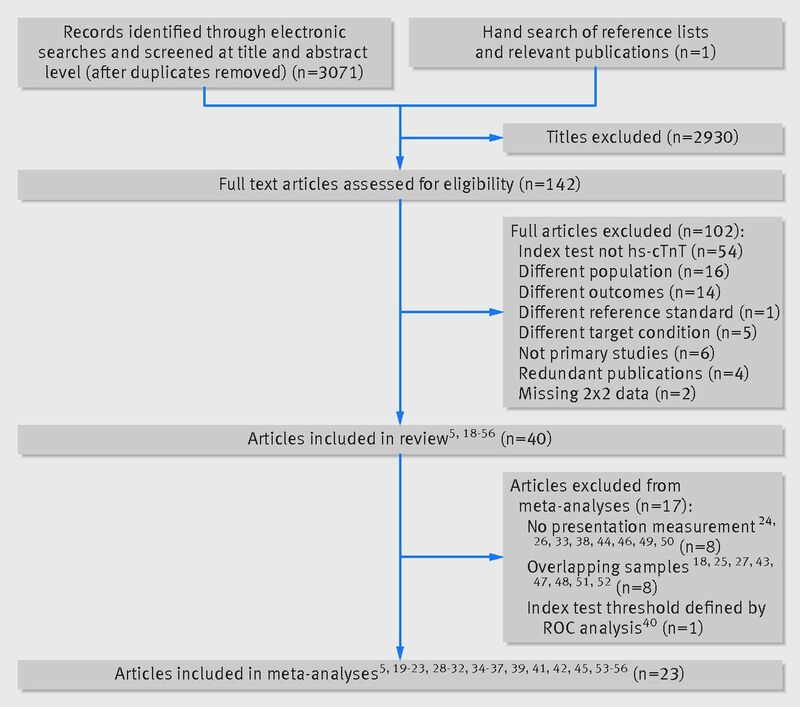 Design Systematic review and meta-analysis of diagnostic test accuracy studies. Data sources Medline, Embase, and other relevant electronic databases were searched for papers published between January 2006 and December 2013. Study selection Studies were included if they evaluated the diagnostic accuracy of a single baseline measurement of Elecsys Troponin T high-sensitive assay for the diagnosis of acute myocardial infarction in patients presenting to the emergency department with suspected acute coronary syndrome. Study appraisal and data synthesis The first author screened all titles and abstracts identified through the searches and selected all potentially relevant papers. The screening of the full texts, the data extraction, and the methodological quality assessment, using the adapted QUADAS-2 tool, were conducted independently by two reviewers with disagreements being resolved through discussion or arbitration. If appropriate, meta-analysis was conducted using the hierarchical bivariate model. Results Twenty three studies reported the performance of the evaluated assay at presentation. The results for 14 ng/L and 3-5 ng/L cut-off values were pooled separately. At 14 ng/L (20 papers), the summary sensitivity was 89.5% (95% confidence interval 86.3% to 92.1%) and the summary specificity was 77.1% (68.7% to 83.7%). At 3-5 ng/L (six papers), the summary sensitivity was 97.4% (94.9% to 98.7%) and the summary specificity was 42.4% (31.2% to 54.5%). This means that if 21 of 100 consecutive patients have the target condition (21%, the median prevalence across the studies), 2 (95% confidence interval 2 to 3) of 21 patients with acute myocardial infarction will be missed (false negatives) if 14 ng/L is used as a cut-off value and 18 (13 to 25) of 79 patients without acute myocardial infarction will test positive (false positives). If the 3-5 ng/L cut-off value is used, <1 (0 to 1) patient with acute myocardial infarction will be missed and 46 (36 to 54) patients without acute myocardial infarction will test positive. Conclusions The results indicate that a single baseline measurement of the Elecsys Troponin T high-sensitive assay could be used to rule out acute myocardial infarction if lower cut-off values such as 3 ng/L or 5 ng/L are used. However, this method should be part of a comprehensive triage strategy and may not be appropriate for patients who present less than three hours after symptom onset. Care must also be exercised because of the higher imprecision of the evaluated assay and the greater effect of lot-to-lot reagent variation at low troponin concentrations. Systematic review registration PROSPERO registration number CRD42013003926. The need to triage patients with chest pain more effectively and efficiently—to avoid unnecessary hospital admissions and to speed up the diagnostic process—has driven the development of the so called high sensitivity cardiac troponin assays. 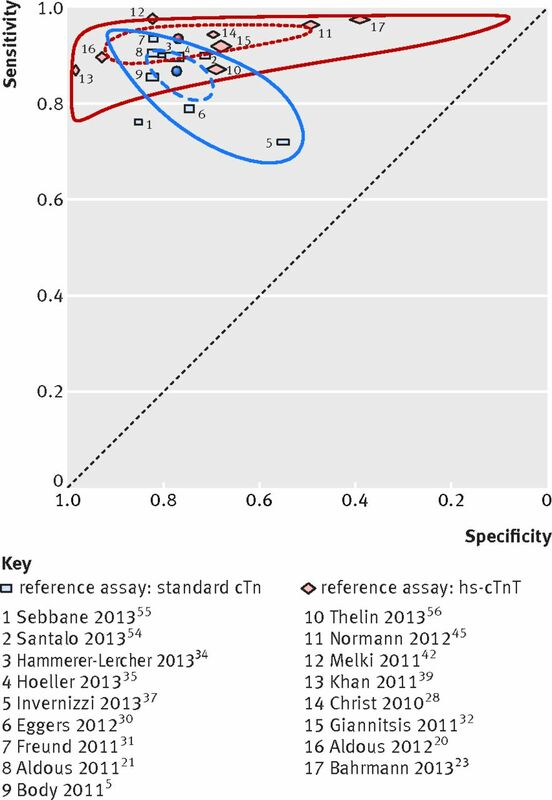 To be classified as high sensitivity, a cardiac troponin assay should meet two criteria: firstly, its total imprecision (coefficient of variation) at the 99th centile of the healthy reference population should be 10% or less; secondly, measureable concentrations above the limit of detection and below the 99th centile should be attainable for at least 50% of the reference population.6 Over the past few years in the United Kingdom, standard troponin assays have gradually been replaced with high sensitivity ones. Although authoritative data on how and to what extent they are used in different National Health Service trusts are unavailable, anecdotal evidence strongly suggests both that standard troponin assay use remains common and that where used high sensitivity assays are being used in the same manner as standard troponin assays, not capitalising on their greater sensitivity. To improve this situation, the National Institute for Health and Care Excellence (NICE) has recently published guidance on the clinical application of high sensitivity troponin assays in the early rule-out of acute myocardial infarction. The guidance recommends the Elecsys Troponin T high-sensitive assay (Roche Diagnostics) and the ARCHITECTSTAT high sensitive troponin I (Abbott Laboratories) for use with early rule-out protocols that include blood samples taken at the patient’s presentation to the emergency department and a second sample three hours later. A third assay, the AccuTnI+3 (Beckman Coulter) has also been evaluated, but owing to insufficient evidence it is recommended only for use in clinical research.7 The guidance recommends the use of the 99th centile as a cut-off value when deciding whether to rule out acute myocardial infarction or to refer the patient for further investigations. Given the high negative predictive value of high sensitivity troponin assays and the fact that patients who present with very low cardiac troponin concentrations also have a very low risk of myocardial infarction, a rule-out strategy based on a single sample at presentation and lower decision thresholds, such as the assay’s limit of detection or limit of blank, has also been proposed.5 The limit of blank is the highest apparent analyte concentration (analytical noise) expected to be found when replicates of a blank sample containing no analyte are tested. The limit of detection, on the other hand, is the lowest analyte concentration likely to be reliably distinguished from the limit of blank and at which detection is feasible.8 Using these cut-off values may provide the means to identify patients at very low risk in whom acute myocardial infarction could be excluded without a second troponin measurement. The effectiveness and feasibility of such a strategy, however, will depend on a range of factors, including the diagnostic sensitivity and the precision of the assay at such low threshold values. We did a systematic review and meta-analyses of studies evaluating the diagnostic accuracy of the Elecsys Troponin T high-sensitive assay (hereinafter referred to as the high sensitivity troponin T assay) for early diagnosis of acute myocardial infarction in patients presenting to the emergency department with chest pain and other symptoms suggestive of acute coronary syndrome. The review protocol was registered on the PROSPERO database (registration number CRD42013003926). Here we report the results pertaining to the hypothesis that a single use of the high sensitivity troponin T assay at presentation is sensitive enough to allow the safe exclusion of acute myocardial infarction. The accuracy estimates obtained for serial measurements and change in troponin concentration (the other objective stated in our review protocol) will be reported in a separate publication. We followed the recommendations of the Cochrane Collaboration’s Diagnostic Test Accuracy Group.10 We searched the following databases: Ovid Medline and Medline in-process, Ovid Embase, Science Citation Index, Medion database, Database of Abstracts of Reviews of Effects (DARE), Cochrane Database of Systematic Reviews (CDSR), Research Portfolio Online Reporting Tools (RePORT, formally CRISP), and International Network of Agencies for Health Technology Assessment (INAHTA). The search strategies for Embase and Medline are provided in web appendix 1. The initial validation study of the high sensitivity troponin T assay was reported in 2010.11 To capture earlier studies using the pre-commercial version of the assay, we extended the search period back to January 2006 and hand searched the reference lists of all relevant publications including systematic reviews and relevant opinion papers. The first author (ZZ) did the initial selection on the basis of titles and abstracts. Full text copies of potentially relevant publications were obtained and screened independently by two reviewers (ZZ, HC, TJH), with all discrepancies resolved through discussion or arbitration by a third reviewer (CH). We used the reference management software EndNote X7 for the selection process. We selected studies for inclusion in the review if they met the following pre-specified criteria: diagnostic cohort studies, evaluating the diagnostic accuracy of the Roche high sensitivity troponin T assay for the diagnosis of acute myocardial infarction, in patients presenting to the emergency department with suspected acute coronary syndrome, against a reference standard based on the contemporary universal definition of acute myocardial infarction,12 and published in peer reviewed journals. We included in the meta-analyses reported here only those studies reporting the diagnostic accuracy of the high sensitivity troponin T assay at the patient’s presentation to the emergency department and using pre-specified positivity thresholds. Two reviewers (ZZ, EY) used a standardised data extraction form to independently abstract relevant details on the publication, the study methods, and the results. We included publications reporting results from the same study or studies based on overlapping samples only if they complemented each other in terms of reported results (for instance, if they reported results for different cut-off values); we took care to avoid double counting. We excluded studies if they failed to meet the inclusion criteria or essential information was missing and could not be obtained from the authors. Two reviewers (ZZ, EY) independently assessed the methodological quality of the included studies by using a modified version of the QUADAS-2 tool (web appendix 2).13 Any disagreements were resolved through discussion and, if necessary, arbitration by another reviewer (CH). The electronic searches identified 3071 records, of which 141 full text articles were assessed for eligibility. Thirty nine of them met the criteria for inclusion in the review, and one additional paper was included from the hand search.5 18 19 20 21 22 23 24 25 26 27 28 29 30 31 32 33 34 35 36 37 38 39 40 41 42 43 44 45 46 47 48 49 50 51 52 53 54 55 56 Twenty studies (23 papers) were included in the meta-analyses reported here (fig 1⇓).5 19 20 21 22 23 28 29 30 31 32 34 35 36 37 39 41 42 45 53 54 55 56 Table 1⇓ shows their main characteristics, and additional details are provided in supplementary tables A-C.
All included studies used a composite reference standard based on the contemporary universal definition of myocardial infarction.12 In terms of reference assays used to diagnose myocardial necrosis, eight studies used serial high sensitivity troponin T assay; 13 studies used standard troponin T or I assays, or a combination of them; one study used a combination of either standard troponin T or I (local assays) and high sensitivity troponin I assays (central laboratory)29; one study used a combination of standard and high sensitivity troponin T assays41; and the reference assay in one study was unclear36 (in some studies the accuracies according to different reference assays were reported separately). Twenty studies reported the performance of high sensitivity troponin T at the manufacturer’s recommended cut-off value of 14 ng/L, which represents the 99th centile of a healthy reference population5 20 21 23 28 29 30 31 32 34 35 36 37 39 41 42 45 54 55 56; four studies reported the performance of the test at 3 ng/L (limit of blank)5 22 28 43 and four at 5 ng/L (limit of detection)19 22 34 53; results for receiver operating characteristics optimised or other cut-off values were also reported in some papers (table 1⇑ and supplementary table C). Table 2⇓ and supplementary table D show the results from the assessment of the methodological quality of the included studies. In approximately half of the studies, patients with ST elevation myocardial infarction were not excluded. As cardiac markers play no role in the diagnosis of this condition, which is made primarily on the results from the electrocardiogram, including patients with this diagnosis may compromise the applicability of the results.32 The use of high sensitivity troponin T as part of the reference standard may lead to incorporation bias, thus inflating the accuracy estimates, whereas using a standard troponin assay as a reference test may result in patients with minor myocardial infarctions being misclassified as false positives. We investigated the effect of using different generations of reference assays in the meta-regression. To obtain clinically relevant estimates of the performance of a single baseline measurement of the high sensitivity troponin T assay, we conducted, as far as the data permitted, separate meta-analyses for the different pre-specified cut-off values reported in the papers. The results from these meta-analyses are presented below. We pooled the results from 20 studies to obtain summary estimates of the sensitivity and specificity at the 14 ng/L cut-off value. When a study reported separately the results for non-ST elevation myocardial infarction and acute myocardial infarction (that is, both patients with ST and non-ST elevation myocardial infarction were included in the study cohort), we included only those for non-ST elevation myocardial infarction, which are clinically more relevant. In a similar way, when both standard troponin and high sensitivity troponin assays were used as reference tests, we included only the results obtained with high sensitivity assays because, being more sensitive, they are able to identify patients with small myocardial infarctions that would be missed by the standard assays. The target condition was acute myocardial infarction in 10 studies and non-ST elevation myocardial infarction in the remaining 10 studies; the reference test was a standard troponin assay in nine studies, high sensitivity troponin assay in eight, either standard or high sensitivity in one, both standard and high sensitivity in one, and unclear in one study. Figure 2⇓ shows a forest plot of the coupled sensitivity and specificity with 95% confidence intervals for each study included in this meta-analysis. Pooling the results produced the following summary estimates: sensitivity 89.5% (95% confidence interval 86.3% to 92.1%), specificity 77.1% (68.7% to 83.7%), positive likelihood ratio 3.9 (2.8 to 5.4), and negative likelihood ratio 0.14 (0.10 to 0.18). The summary receiver operating characteristics plot (fig 3⇓) shows the summary sensitivity and specificity (the solid blue spot in the middle) and the 95% confidence and prediction regions (the inner and outer ellipses, respectively). As shown in figures 2⇑ and 3⇑, a significant level of heterogeneity was apparent in the results, greater in specificity than in sensitivity. We investigated the effect of the target condition (acute myocardial infarction versus non-ST elevation myocardial infarction) and the reference test (standard versus high sensitivity troponin assay) on the summary estimates of sensitivity and specificity by adding them as covariates to a bivariate regression model (one covariate at a time) and used a likelihood ratio test to determine the statistical significance of the results. As in two studies a combination of standard and high sensitivity assays were used as a reference test,29 41 and the type of the reference assay was unclear in another study,36 we excluded those three studies from the meta-regression. Without them, the likelihood ratio test showed that the use of different reference standards accounts for some of the variability in the sensitivity (P=0.008) but not in the specificity (P=0.66) (fig 4⇓). A model that allowed for sensitivity and its variance to vary between studies using different reference tests (standard versus high sensitivity assays) produced the following summary estimates: sensitivity (standard reference assay) 87.7% (82.6% to 89.9%), sensitivity (high sensitivity reference assay) 93.4% (89.8% to 95.7%), specificity 74.7% (73.6% to 75.8%), positive likelihood ratio (standard reference assay) 3.43 (3.08 to 3.82), positive likelihood ratio (high sensitivity reference assay) 3.69 (3.13 to 4.36), negative likelihood ratio (standard reference assay) 0.18 (0.14 to 0.23), negative likelihood ratio (high sensitivity reference assay) 0.09 (0.06 to 0.14). The target condition, on the other hand, had no effect on the results (P=0.79). 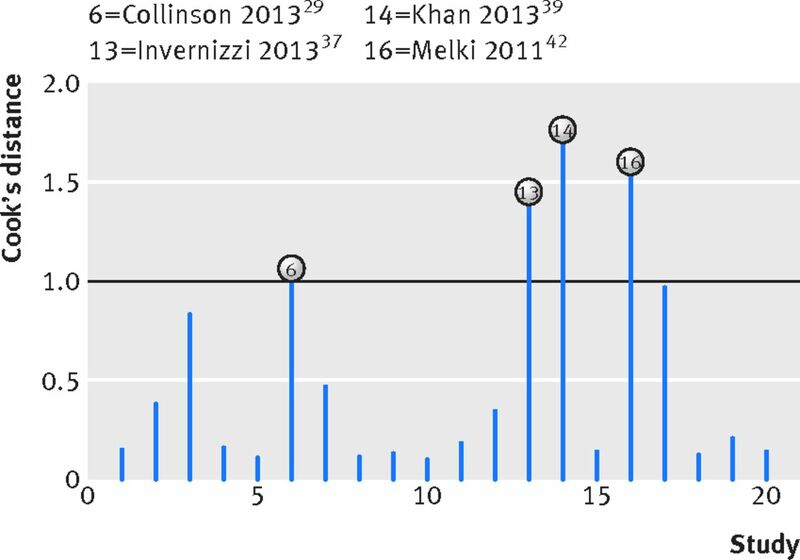 On the basis of the Cook’s distance, we found the following studies to be the most influential in the meta-analysis (in descending order): Khan et al,39 Melki et al,42 Invernizzi et al,37 and Collinson et al29 (fig 5⇓). 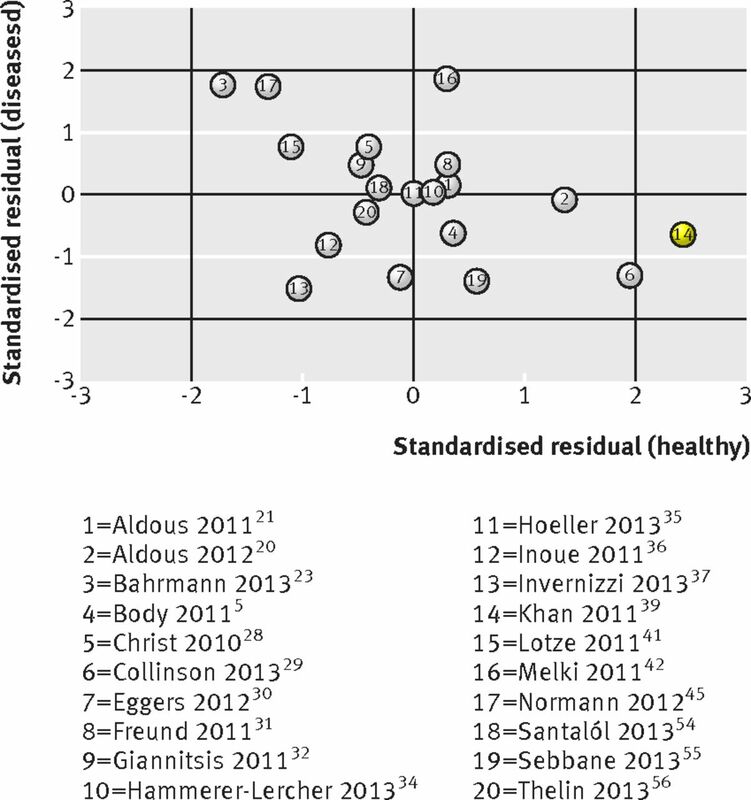 Of these, only Khan et al was identified as an outlier having the highest standardised residuals for specificity (fig 6⇓). After refitting the model and leaving this study out, we observed no change in sensitivity (89.5% v 89.7%) but specificity decreased from 77.1% to 74.9%. This could be explained by the fact that this study excluded patients without coronary artery disease, thus reducing the probability of false positive results. Seven papers reported the results for 3 ng/L and/or 5 ng/L cut-off values at presentation.5 19 22 28 34 43 53 Given the small number of studies, pooling the data for each cut-off value separately would have produced unreliable results. Instead, we decided to obtain more precise and reliable summary estimates by including in the meta-analysis all independent 3 ng/L and 5 ng/L data.5 19 22 28 34 53 Two studies reported the results for both cut-off values.22 43 53 As in this analysis we were interested mainly in the sensitivity of the test (its accuracy for ruling out acute myocardial infarction), we decided to include the results for 5 ng/L as the performance at a higher cut-off value would produce a lower sensitivity estimate thus representing the worse case scenario. Owing to the inverse correlation between sensitivity and specificity, we could assume that using even lower cut-off values would further increase the sensitivity of the assay and its ability to rule out the target condition. Thus, from the APACE trial we excluded the results reported by Meune et al,43 included those reported by Rubini Gimenez et al,53 and included only the 5 ng/L data reported by Aldous et al.22 Also, Christ et al reported two different sets of 3 ng/L results, obtained using standard troponin T and high sensitivity troponin T as refrence assays.28 As in the previous analysis, we included the results obtained by using high sensitivity troponin T as a reference assay, which is more sensitive and, thefeore, more likely to capture small myocardial infarctions. 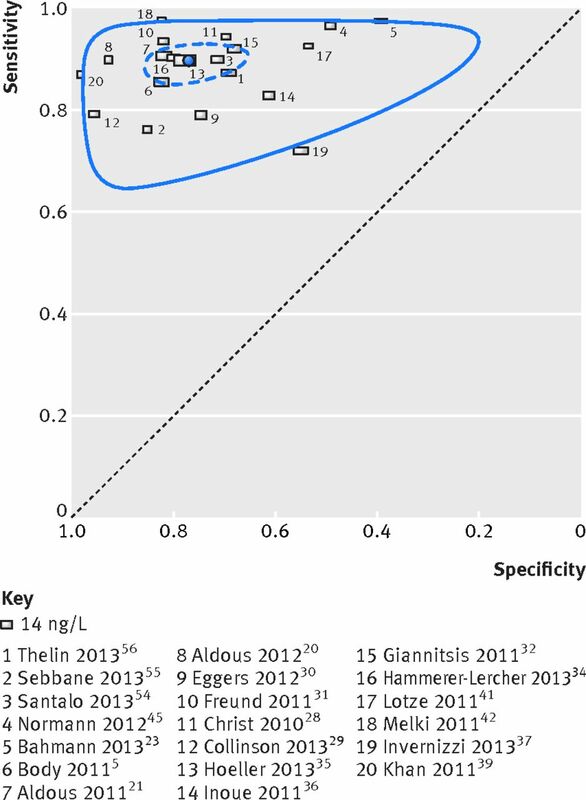 Figure 7⇓ shows a forest plot of the sensitivities and specificities of the included studies. Pooling the results from the six studies produced the following summary estimates: sensitivity 97.4% (94.9% to 98.7%), specificity 42.4% (31.2% to 54.5%), positive likelihood ratio 1.69 (1.40 to 2.05), and negative likelihood ratio 0.06 (0.04 to 0.10) (fig 8⇓). In the meta-analyses reported here, we included 20 studies (23 papers) evaluating the diagnostic accuracy of a single baseline determination of the Elecsys Troponin T high-sensitive assay at pre-specified cut-off values in patients presenting to the emergency department with suspected acute coronary syndrome. We pooled data separately for 14 ng/L and for the combined 3 and 5 ng/L cut-off values. At 14 ng/L, the 99th centile of a healthy reference population as reported by the manufacturer, the summary sensitivity and specificity were 89.5% (95% confidence interval 86.3% to 92.1%) and 77.1% (68.7% to 83.7%). This means that if the pre-test probability is 21% (the median prevalence of the target condition across the studies), then 21 of 100 tested patients will have a final diagnosis of acute myocardial infarction; of them, between 18 and 19 will test positive (true positives) and two or three will test negative (false negatives). Of the 79 without the target condition, between 54 and 66 will test negative (true negatives) and between 13 and 25 will test positive (false positives). Pooling all independent data for 3 ng/L and 5 ng/L cut-off values produced a summary sensitivity of 97.4% (94.9% to 98.7%) and a summary specificity of 42.4% (31.2% to 54.5%). This means that of 21 patients with acute myocardial infarction, between 20 and 21 will test positive (true positives) and between none and one will be missed (false negatives). Of the 79 without the target condition, between 25 and 43 will test negative (true negatives) and between 36 and 54 will test positive (false positives). Given the presence of a clear threshold effect—sensitivity increases at the expense of specificity when a lower threshold is used—we can anticipate that in patients with high sensitivity troponin T concentrations below 3 ng/L the sensitivity will be even higher and no patients with myocardial infarction will be missed. On the other hand, using lower cut-off values will inevitably result in more false positives. One unexpected result in our review was the effect of the reference assay on the summary estimates. The meta-regression at a 14 ng/L cut-off value showed that the sensitivity estimate was higher when serial high sensitivity troponin assay was used as a reference test and lower when the reference test was a standard troponin assay. Using a high sensitivity rather than a standard troponin assay as a reference test would normally result in fewer false positives. This is because patients with borderline troponin concentrations that fall below the positivity threshold of the standard assay but above that of the high sensitivity one would be reclassified from false positives to true positives.20 Although this would affect the specificity of the test, it would have little effect on its sensitivity. It is entirely possible that the higher sensitivity obtained by using high sensitivity assay as a reference test is a result of incorporation bias rather than a reflection of a real effect. If this is the case, it is unlikely to have affected the summary estimates obtained for the 3-5 ng/L cut-off value, as in this meta-analysis all but one study used a standard assay as the reference test. We were unable to investigate the effect of some characteristics of patients that are known to affect the accuracy of high sensitivity troponin assays, such as age and comorbidities, as such analysis would have required data from individual patients.10 Most of these factors, however, affect the specificity of the test owing to the increased number of false positives in older patients or patients with other cardiac or non-cardiac conditions and, therefore, are of little relevance to the question we tried to answer here—namely, whether the evaluated test has high enough sensitivity to allow exclusion of acute myocardial infarction with a single baseline measurement. A further threat to the validity of our results, especially those related to 3-5 ng/L cut-off values, comes from the downward shift observed in the Elecsys Troponin T high-sensitive assay at low concentrations of the measurement interval.57 The shift has caused as much as 88% of the samples from healthy people to be measured with values below the limit of blank rather than the 50% or less in the initial evaluation study.58 59 Recently, the manufacturer Roche Diagnostics has made adjustments to return the assay to its original specifications.57 58 As a consequence, great care would need to be taken with the way the test is carried out in practice to ensure that the test’s accuracy at low thresholds achieved in the research reviewed is maintained consistently in the long term. This need for care is reinforced by the assay’s total imprecision being much higher at the low end of the measurement interval compared with the required coefficient of variation 10% or less at the 99th centile. With these provisos, the results from the meta-analyses suggest that although single measurement of high sensitivity troponin T at presentation may result in unacceptably high number of patients with acute myocardial infarction being missed if the 99th centile (14 ng/L) is used as a cut-off value, lowering the decision threshold to the limit of blank or limit of detection could increase the negative predictive value of the assay to a point at which no patients with the target condition will be missed. To appreciate the significance of this result, we need to know what proportion of patients actually present with baseline concentrations below the assay’s limit of blank and limit of detection. Two of the included studies reported such data. In the study by Body et al, 195 (27.7%) of the included 703 patients had undetectable (<3 ng/L) high sensitivity troponin T concentrations at presentation and none of them was diagnosed as having myocardial infarction. Of the 296 (42.1%) patients who had concentrations between 3 ng/L and 14 ng/L, 19 (6.4%) patients developed acute myocardial infarction.5 In the APACE trial, as reported by Rubini Gimenez et al,53 of the 2245 patients included in the analysis, 550 (25%) had values below 5 ng/L at presentation and eight (1.5%) of them were diagnosed as having myocardial infarction. These studies show that a significant proportion of the patients who undergo troponin testing in emergency setting present with high sensitivity troponin T concentrations below the limit of detection, and only a very small proportion of them are later diagnosed as having acute myocardial infarction. A diagnostic strategy that incorporates a baseline measurement with the Elecsys Troponin T high-sensitive assay and uses a low cut-off value, such as the limit of blank or limit of detection, to rule out myocardial infarction may help to reduce the number of patients who undergo unnecessary further testing (often associated with potentially harmful effects) and may save resources and relieve pressure on overcrowded emergency departments. Patients with troponin concentrations above this low rule-out threshold could undergo the usual second sample testing before a decision about discharge or admission for further investigations is made. A recently published study by Body et al suggests that an alternative to the low threshold rule-out strategy discussed above might be available.60 In this study, the performance of the 99th centile of the Elecsys Troponin T high-sensitive assay at presentation was evaluated not as a standalone test but in conjunction with the emergency physicians’ clinical judgment (based on the patient’s history and clinical examination) and the results from the initial electrocardiogram. When combined, the diagnostic information from these three sources had 100% (95.4% to 100%) sensitivity and 100% (95.7% to 100%) negative predictive value. These findings suggest that the summary estimates obtained from our meta-analyses may underestimate the sensitivity of the assay and that using the 99th centile cut-off value in a single measurement at presentation, especially in patients who present more than three hours after symptom onset, may be sufficient to rule out acute myocardial infarction. As Body et al point out, however, such a strategy needs to be prospectively validated in independent populations before clinical implementation. In conclusion, when used with blood samples drawn at the patient’s presentation to the emergency department and given a pre-test probability of 21%, the Elecsys Troponin T high-sensitive assay will miss two or three patients with acute myocardial infarction if the 99th centile is used as a cut-off value and no patients or one patient if 5 ng/L is used. Using 3 ng/L is likely to reduce even further the proportion of patients with the target condition that would be missed. In patients presenting within three hours of symptom onset, the proportion of missed patients with acute myocardial infarction might be higher. The above results suggest that if low cut-off values are used a single measurement of high sensitivity troponin T at presentation might be sufficient to rule out acute myocardial infarction. Such a strategy would, however, need to be carefully implemented owing to the high imprecision of the assay and greater effect of lot-to-lot reagent variation at low troponin concentrations. In clinical practice, the 99th centile of the index assay used with samples taken at presentation might be able to exclude acute myocardial infarction with sufficient accuracy when combined with the results from the patient’s history, clinical examination, and the initial electrocardiogram. This, however, needs to be prospectively validated in independent cohorts before implementation. We acknowledge the contribution of Yemisi Takwoingi from the University of Birmingham, who provided valuable advice on the statistical methods used in this study. Contributors: ZZ, CH, SF, and TS drafted the protocol. MR developed the search strategy and did the electronic searches. ZZ, HC, TJ-H, and EY screened the titles and abstracts and selected studies for inclusion. ZZ and EY carried out the data extraction and methodological quality assessment. CH, SF, and TS provided advice and arbitration on the selection process, data extraction, and methodological quality assessment. ZZ and VN did the statistical analysis. ZZ wrote the original draft, and the other authors revised the draft critically for important intellectual content and approved the final version of the paper. ZZ and CH are the guarantors. Funding: This research was funded by the South West Academic Health Science Network (AHSN) and the National Institute for Health Research (NIHR) Collaboration for Leadership for Applied Health Research and Care for the South West Peninsula. The views expressed are those of the author(s) and not necessarily those of the NHS, the NIHR, or the Department of Health. The AHSN and the NIHR had no involvement in the study design; in the collection, analysis, and interpretation of data; in the writing of the report; or in the decision to submit the paper for publication. Competing interests: All authors have completed the ICMJE uniform disclosure form at www.icmje.org/coi_disclosure.pdf (available on request from the corresponding author) and declare: ZZ and CH received financial support from the NIHR Collaboration for Leadership in Applied Health Research and Care for the South West Peninsula; no financial relationships with any organisations that might have an interest in the submitted work in the previous three years; no other relationships or activities that could appear to have influenced the submitted work. Transparency declaration: The lead author (ZZ) affirms that this manuscript is an honest, accurate, and transparent account of the study being reported; that no important aspects of the study have been omitted; and that any discrepancies from the study as planned (and, if relevant, registered) have been explained. Goodacre S, Cross E, Arnold J, Angelini K, Capewell S, Nicholl J. The health care burden of acute chest pain. Heart2005;91:229-30. Niska R, Bhuiya F, Xu J. National hospital ambulatory medical care survey: 2007 emergency department summary. Natl Health Stat Report2010;26:1-31. Hamm CW, Bassand J-P, Agewall S, Bax J, Boersma E, Bueno H, et al. ESC guidelines for the management of acute coronary syndromes in patients presenting without persistent ST-segment elevation: the task force for the management of acute coronary syndromes (ACS) in patients presenting without persistent ST-segment elevation of the European Society of Cardiology (ESC). Eur Heart J2011;32:2999-3054. Pope JH, Aufderheide TP, Ruthazer R, Woolard RH, Feldman JA, Beshansky JR, et al. Missed diagnoses of acute cardiac ischemia in the emergency department. N Engl J Med2000;342:1163-70. Body R, Carley S, McDowell G, Jaffe AS, France M, Cruickshank K, et al. Rapid exclusion of acute myocardial infarction in patients with undetectable troponin using a high-sensitivity assay. J Am Coll Cardiol2011;58:1332-9. Apple FS, Collinson PO. Analytical characteristics of high-sensitivity cardiac troponin assays. Clin Chem2012;58:54-61. National Institute for Health and Care Excellence. Myocardial infarction (acute): early rule out using high-sensitivity troponin tests (Elecsys Troponin T high-sensitive, ARCHITECT STAT High Sensitive Troponin-I and AccuTnI+3 assays). NICE, 2014 (available at www.nice.org.uk/guidance/dg15). Armbruster DA, Pry T. Limit of blank, limit of detection and limit of quantitation. Clinical Biochem Rev2008;29(suppl 1):S49-52. Roche Diagnostics. Elecsys® Troponin T high sensitive (TnT-hs). 2014. www.cobas.com/content/internet/product/cobas/en/home/product/clinical-and-immunochemistry-testing/elecsys-troponin-t-hs-tnt-hs.html. Cochrane Collaboration. Diagnostic Test Accuracy Working Group: handbook for DTA reviews. http://srdta.cochrane.org/handbook-dta-reviews. Giannitsis E, Kurz K, Hallermayer K, Jarausch J, Jaffe AS, Katus HA. Analytical validation of a high-sensitivity cardiac troponin T assay. Clin Chem2010;56:254-61. Thygesen K, Alpert JS, Jaffe AS, Simoons ML, Chaitman BR, White HD. Third universal definition of myocardial infarction. Circulation2012;126:2020-35. Whiting PF, Rutjes AW, Westwood ME, Mallett S, Deeks JJ, Reitsma JB, et al. 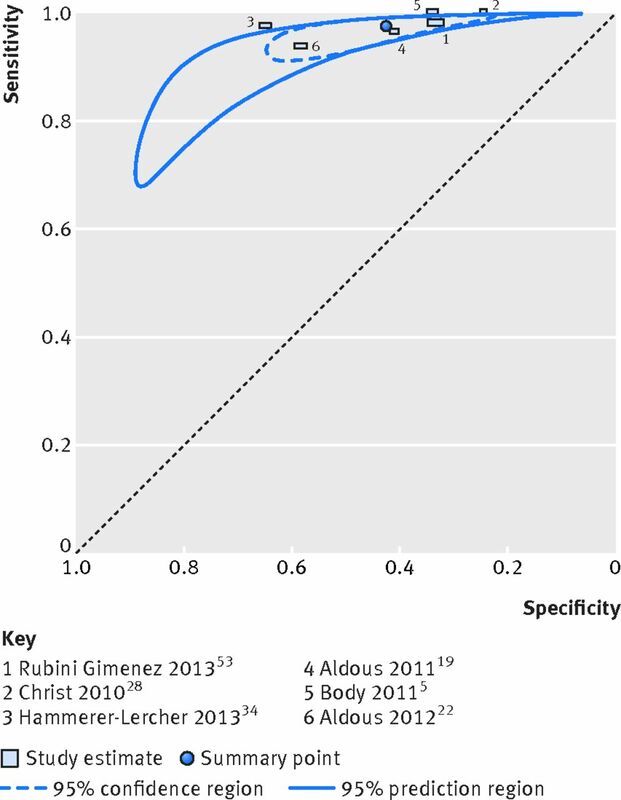 QUADAS-2: a revised tool for the quality assessment of diagnostic accuracy studies. Ann Intern Med2011;155:529-36. Reitsma JB, Glas AS, Rutjes AW, Scholten RJ, Bossuyt PM, Zwinderman AH. Bivariate analysis of sensitivity and specificity produces informative summary measures in diagnostic reviews. J Clin Epidemiol2005;58:982-90. MIDAS: Stata module for meta-analytical integration of diagnostic test accuracy studies [program]. S456880 version: Boston College Department of Economics, 2007. Harbord RM, Whiting P. metandi: meta-analysis of diagnostic accuracy using hierarchical logistic regression. Stata J2009;9:211-29. Takwoingi Y. Meta-analysis of test accuracy studies in Stata: a bivariate model approach. Version 1.0. 2013. http://srdta.cochrane.org/sites/srdta.cochrane.org/files/uploads/Stata%20DTA%20meta-analysis.zip. Aldous S, Pemberton C, Richards AM, Troughton R, Than M. High-sensitivity troponin T for early rule-out of myocardial infarction in recent onset chest pain. Emerg Med J2012;29:805-10. Aldous SJ, Florkowski CM, Crozier IG, Elliott J, George P, Lainchbury JG, et al. Comparison of high sensitivity and contemporary troponin assays for the early detection of acute myocardial infarction in the emergency department [correction in: Ann Clin Biochem 2012;49:208]. Ann Clin Biochem2011;48:241-8. Aldous SJ, Florkowski CM, Crozier IG, Than MP. The performance of high sensitivity troponin for the diagnosis of acute myocardial infarction is underestimated. Clin Chem Lab Med2012;50:727-9. Aldous SJ, Richards AM, Cullen L, Than MP. Early dynamic change in high-sensitivity cardiac troponin T in the investigation of acute myocardial infarction. Clin Chem2011;57:1154-60. Aldous SJ, Richards M, Cullen L, Troughton R, Than M. Diagnostic and prognostic utility of early measurement with high-sensitivity troponin T assay in patients presenting with chest pain. CMAJ2012;184:E260-8. Bahrmann P, Bahrmann A, Breithardt OA, Daniel WG, Christ M, Sieber CC, et al. Additional diagnostic and prognostic value of copeptin ultra-sensitive for diagnosis of non-ST-elevation myocardial infarction in older patients presenting to the emergency department. Clin Chem Lab Med2013;51:1307-19. Bahrmann P, Christ M, Bahrmann A, Rittger H, Heppner HJ, Achenbach S, et al. A 3-hour diagnostic algorithm for non-ST-elevation myocardial infarction using high-sensitivity cardiac troponin T in unselected older patients presenting to the emergency department. J Am Med Dir Assoc2013;14:409-16. Balmelli C, Meune C, Twerenbold R, Reichlin T, Rieder S, Drexler B, et al. Comparison of the performances of cardiac troponins, including sensitive assays, and copeptin in the diagnostic of acute myocardial infarction and long-term prognosis between women and men. Am Heart J2013;166:30-7. Biener M, Mueller M, Vafaie M, Keller T, Blankenberg S, White HD, et al. Comparison of a 3-hour versus a 6-hour sampling-protocol using high-sensitivity cardiac troponin T for rule-out and rule-in of non-STEMI in an unselected emergency department population. Int J Cardiol2013;167:1134-40. Chenevier-Gobeaux C, Meune C, Freund Y, Wahbi K, Claessens YE, Doumenc B, et al. Influence of age and renal function on high-sensitivity cardiac troponin T diagnostic accuracy for the diagnosis of acute myocardial infarction. Am J Cardiol2013;111:1701-7. Christ M, Popp S, Pohlmann H, Poravas M, Umarov D, Bach R, et al. Implementation of high sensitivity cardiac troponin T measurement in the emergency department. Am J Med2010;123:1134-42. Collinson PO, Gaze DC, Thokala P, Goodacre S. Randomised Assessment of Treatment using Panel Assay of Cardiac markers—Contemporary Biomarker Evaluation (RATPAC CBE). Health Technol Assess2013;17:v-vi, 1-122. Eggers KM, Venge P, Lindahl B. High-sensitive cardiac troponin T outperforms novel diagnostic biomarkers in patients with acute chest pain. Clin Chim Acta2012;413:1135-40. Freund Y, Chenevier-Gobeaux C, Bonnet P, Claessens Y-E, Allo J-C, Doumenc B, et al. High-sensitivity versus conventional troponin in the emergency department for the diagnosis of acute myocardial infarction. Crit Care2011;15:R147. Giannitsis E, Kehayova T, Vafaie M, Katus HA. Combined testing of high-sensitivity troponin T and copeptin on presentation at prespecified cutoffs improves rapid rule-out of non-ST-segment elevation myocardial infarction. Clin Chem2011;57:1452-5. Haaf P, Drexler B, Reichlin T, Twerenbold R, Reiter M, Meissner J, et al. High-sensitivity cardiac troponin in the distinction of acute myocardial infarction from acute cardiac noncoronary artery disease. Circulation2012;126:31-40. Hammerer-Lercher A, Ploner T, Neururer S, Schratzberger P, Griesmacher A, Pachinger O, et al. High-sensitivity cardiac troponin T compared with standard troponin T testing on emergency department admission: how much does it add in everyday clinical practice? J Am Heart Assoc2013;2:e000204. Hoeller R, Gimenez MR, Reichlin T, Twerenbold R, Zellweger C, Moehring B, et al. Normal presenting levels of high-sensitivity troponin and myocardial infarction. Heart2013;99:1567-72. Inoue K, Suwa S, Ohta H, Itoh S, Maruyama S, Masuda N, et al. Heart fatty acid-binding protein offers similar diagnostic performance to high-sensitivity troponin T in emergency room patients presenting with chest pain. Circ J2011;75:2813-20. Invernizzi L, Doka M, Cappellini F, Signorelli S, Falbo R, Ronzoni G, et al. [Effectiveness of highly sensitive troponin T assay for early diagnosis of acute myocardial infarction (AMI)] [Italian]. Biochim Clin2013;37:36-9. Irfan A, Reichlin T, Twerenbold R, Meister M, Moehring B, Wildi K, et al. Early diagnosis of myocardial infarction using absolute and relative changes in cardiac troponin concentrations. Am J Med2013;126:781-8.e2. Khan DA, Sharif MS, Khan FA. Diagnostic performance of high-sensitivity troponin T, myeloperoxidase, and pregnancy-associated plasma protein A assays for triage of patients with acute myocardial infarction. Korean J Lab Med2011;31:172-8. Kurz K, Giannitsis E, Becker M, Hess G, Zdunek D, Katus HA. Comparison of the new high sensitive cardiac troponin T with myoglobin, h-FABP and cTnT for early identification of myocardial necrosis in the acute coronary syndrome. Clin Res Cardiol2011;100:209-15. Lotze U, Lemm H, Heyer A, Muller K. Combined determination of highly sensitive troponin T and copeptin for early exclusion of acute myocardial infarction: first experience in an emergency department of a general hospital. Vasc Health Risk Manag2011;7:509-15. Melki D, Lind S, Agewall S, Jernberg T. Diagnostic value of high sensitive troponin T in chest pain patients with no persistent ST-elevations. Scand Cardiovasc J2011;45:198-204. Meune C, Balmelli C, Vogler E, Twerenbold R, Reiter M, Reichlin T, et al. Consideration of high-sensitivity troponin values below the 99th percentile at presentation: does it improve diagnostic accuracy? Int J Cardiol2013;168:3752-7. Mueller M, Biener M, Vafaie M, Doerr S, Keller T, Blankenberg S, et al. Absolute and relative kinetic changes of high-sensitivity cardiac troponin T in acute coronary syndrome and in patients with increased troponin in the absence of acute coronary syndrome. Clin Chem2012;58:209-18. Normann J, Mueller M, Biener M, Vafaie M, Katus HA, Giannitsis E. Effect of older age on diagnostic and prognostic performance of high-sensitivity troponin T in patients presenting to an emergency department. Am Heart J2012;164:698-705.e4. Olivieri F, Galeazzi R, Giavarina D, Testa R, Abbatecola AM, Ceka A, et al. Aged-related increase of high sensitive Troponin T and its implication in acute myocardial infarction diagnosis of elderly patients. Mech Ageing Dev2012;133:300-5. Potocki M, Reichlin T, Thalmann S, Zellweger C, Twerenbold R, Reiter M, et al. Diagnostic and prognostic impact of copeptin and high-sensitivity cardiac troponin T in patients with pre-existing coronary artery disease and suspected acute myocardial infarction. Heart2012;98:558-65. Reichlin T, Hochholzer W, Bassetti S, Steuer S, Stelzig C, Hartwiger S, et al. Early diagnosis of myocardial infarction with sensitive cardiac troponin assays. N Engl J Med2009;361:858-67. Reichlin T, Irfan A, Twerenbold R, Reiter M, Hochholzer W, Burkhalter H, et al. Utility of absolute and relative changes in cardiac troponin concentrations in the early diagnosis of acute myocardial infarction. Circulation2011;124:136-45. Reichlin T, Schindler C, Drexler B, Twerenbold R, Reiter M, Zellweger C, et al. One-hour rule-out and rule-in of acute myocardial infarction using high-sensitivity cardiac troponin T. Arch Intern Med2012;172:1211-8. Reiter M, Twerenbold R, Reichlin T, Benz B, Haaf P, Meissner J, et al. Early diagnosis of acute myocardial infarction in patients with pre-existing coronary artery disease using more sensitive cardiac troponin assays. Eur Heart J2012;33:988-97. Reiter M, Twerenbold R, Reichlin T, Haaf P, Peter F, Meissner J, et al. Early diagnosis of acute myocardial infarction in the elderly using more sensitive cardiac troponin assays. Eur Heart J2011;32:1379-89. Rubini Gimenez M, Hoeller R, Reichlin T, Zellweger C, Twerenbold R, Reiter M, et al. Rapid rule out of acute myocardial infarction using undetectable levels of high-sensitivity cardiac troponin. Int J Cardiol2013;168:3896-901. Santaló M, Martin A, Velilla J, Povar J, Temboury F, Balaguer J, et al. Using high-sensitivity troponin T: the importance of the proper gold standard. Am J Med2013;126:709-17. Sebbane M, Lefebvre S, Kuster N, Jreige R, Jacques E, Badiou S, et al. Early rule out of acute myocardial infarction in ED patients: value of combined high-sensitivity cardiac troponin T and ultrasensitive copeptin assays at admission. Am J Emerg Med2013;31:1302-8. Thelin J, Borna C, Erlinge D, Ohlin B. The combination of high sensitivity troponin T and copeptin facilitates early rule-out of ACS: a prospective observational study. BMC Cardiovasc Disord2013;13:42. Apple FS, Jaffe AS. Clinical implications of a recent adjustment to the high-sensitivity cardiac troponin T assay: user beware. Clin Chem2012;58:1599-600. Hallermayer K, Jarausch J, Menassanch-Volker S, Zaugg C, Ziegler A. Implications of adjustment of high-sensitivity cardiac troponin T assay. Clin Chem2013;59:572-4. Saenger AK, Beyrau R, Braun S, Cooray R, Dolci A, Freidank H, et al. Multicenter analytical evaluation of a high-sensitivity troponin T assay. Clin Chim Acta2011;412:748-54. Body R, Cook G, Burrows G, Carley S, Lewis PS. Can emergency physicians ‘rule in’ and ‘rule out’ acute myocardial infarction with clinical judgement? Emerg Med J2014;31:872-6. Westwood M, Ramaekers B, Whiting P, Thokala P, Joore M, Armstrong N, et al. High sensitivity troponin assays for the early rule-out or diagnosis of acute myocardial infarction in people with acute chest pain: a systematic review and cost-effectiveness analysis. 2014. www.nice.org.uk/guidance/dg15/evidence/myocardial-infarction-acute-early-rule-out-using-highsensitivity-troponin-tests-elecsys-troponin-t-highsensitive-architect-stat-high-sensitive-troponini-and-accutni3-assays-dar2.